Paper copies of my comics are now available now at "The Comix Revolution" in Evanston IL. Sweet Andrea (see above) and darling Stella (not pictured) went and bought the very first copies of my book. I can't thank them enough. No court in the land would convict me. Like to comment of today's comic? 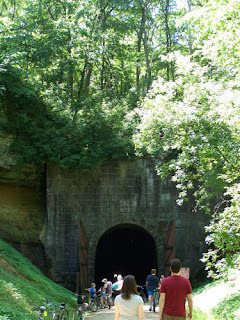 This is the Stewart Train Tunnel in Wisconsin. Last weekend some friends took us on a hike through the woods to see the thing. The tunnel is about 20 degrees colder than the outside air and about a 1/2 a mile long. Our friends suggested we walk through the tunnel without a flashlight. It is pitch black inside and constant gobs of chilly water drip down on your head. "You know, more than 100 people died making this tunnel..."
Given the option, I don’t think I’d like to die building a train tunnel in 1888. Yep. Not for me, thanks anyway. The first time I received an instant message it was from my long distance boyfriend during my freshman year in college. I responded by skittering under my desk. My only thought, "Crap...can he see me?" Two years earlier I sent an email to the same boyfriend asking, "Is it ok to swear on the Internet?" My 12-year-old cousins laugh at my MySpace page. However, I need to strike out into the blogosphere like the blind (possibly drunk) baby deer. Earlier this year I started a social project of sorts. I asked a slightly macabre question of my family and friends and adapted their answers into an online comic. Check it out at preposthumous.com. New comics go up 4 days a week for your "my coffee break ended 15 minuets ago" reading pleasure. Wanna talk about the project? Come here. Want free stuff outa me? Come here. Wanna see me ineptly post about minutia? You know what to do!